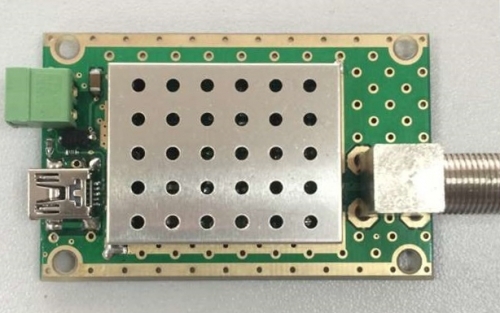 Click here to buy the N3 SDR Receiver from the ThumbSat store! Sure, you can drive a nail into a board using a brick, but the whole time you're doing it, you know it's not right. The same thing goes through our minds every time we plug in a Generation 1 or Generation 2 ThumbNet dongle. It feels a little wrong to use a circuit designed for TV reception for Software Defined Radio. We went back to the drawing board, got a clean sheet of paper and designed an entirely new, next generation circuit that is completely compatible with existing SDR software and hardware. We like to push the edge of what's possible. 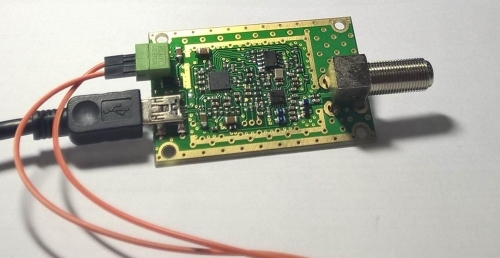 Introducing the ThumbNet N3 SDR Receiver. The N3 receiver in the custom made aluminum case. The next Generation, ThumbNet N3 is designed from the ground up to be as simple to use as older generation dongles, but with powerful hardware features for advanced hobbyists and experimenters. We removed all of the excess components that were sources of noise or interference in other dongles, and optimized the circuit for simplicity, sensitivity and selectability. Then we added a port to use a cable with the extremely common mini-USB connection so that the N3 is less prone to noise from the host computer than a traditional dongle. Finally, the use of standard Surface Mount 0603 or larger components makes it simple for testing or modification. We built them for our own use, then decided to offer them to everyone. ThumbNet v1 (left) vs N3 (right). ~15dbm higher signal strength, quieter background noise and far less waterfall distortion. PLEASE NOTE: The N3 draws approximately 410 milliamps of current and care should be taken, even when using a powered USB hub, as it could possibly exceed the current limit of the USB port. (5v 1000mA linear power supplies are available in the ThumbSat Store here). 100% of the profits from the sale of the N3 are used to support ThumbNet, the non-profit organization that is helping students around the world learn about Science, Technology, Engineering and Math (STEM) as well as Space, Radio and Meteorology. All at the same time! You can read more about ThumbNet here, but to summarize: ThumbNet was born to encourage students around the world to look up at the stars and to give them a chance to feel that they are part of something larger. The hardware to track and monitor radio signals from satellites in orbit is donated to the schools by ThumbNet, and with over 200 volunteer groups in more than 72 countries, we're having an immediate and positive effect on the lives of hundreds of students around the globe! 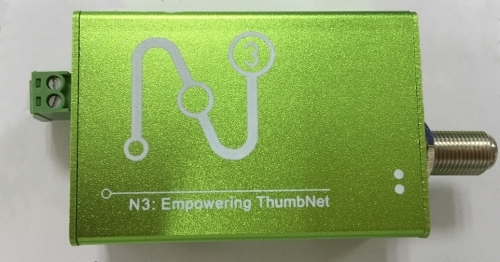 ThumbNet averages three new volunteer groups a week, so when you buy an N3 receiver for your workshop, you'll know that you're making a difference by supporting a global effort to educate and inspire students. We've designed the N3 receiver to be the right tool for the job for our ThumbNet volunteers, and at only $25.75 each, we think you'll agree that it's the right tool for you too! N3 Production Model with RF Screen removed. The following are some of the questions we've gotten recently concerning the N3 receiver. Has anyone reviewed the hardware yet? A handful of independent tests have been done on the Qualification Models of the N3, and the results have been quite positive. Qualification models are the prototype boards that are built and used to ensure that the product works as the engineering team expected and that the manufacturer has understood the design drawings correctly before production begins. In our case, the entire team worked together flawlessly and the qualification boards worked as expected. These boards were then passed to independent testers and some of them put their comments on the web at the links below. We will post reviews of the production models as they become available from testers. What is the frequency range of the N3? Does the N3 use an 8 bit ADC? The ADC is inside the RTL2832U, so yes. Although like most things, it isn't as simple as that. The actual hardware can only use about 7 to 7.5 bits of that 8 bit resolution BUT at high sample rates and narrow bandwidths, oversampling increases resolution back past 8 bits .... AND there is an AGC loop in action, so instantaneous (wanted adjacent to interferer) and apparent (single signal) dynamic ranges are different. Does the N3 suffer from gaps in frequency coverage? The frequency range is a result of the R820T2 tuner IC that is common in many SDR receivers. As can be seen by this very popular website (and a ThumbNet Station volunteer! ), http://www.rtl-sdr.com/about-rtl-sdr/ the ThumbNet N3 Receiver does not suffer from a gap in frequency coverage. Can I get an SMA or N connector instead of an F connector? Sorry. Due to the manufacturing requirements and minimum order sizes, we cannot currently offer the N3 with any other connector than the F that is shown. While we're trying to source some adapters to go along with the receiver, it's important to remember that the F connector was specifically chosen for the N3, since the receiver was designed to support ThumbNet. A great very many remote locations do not have access to an SMA connector for building an antenna with students, but almost all the world has a piece of coax cable with an F connector on it for TV connections. If you truly need an SMA, N or other style connector on the N3, and can place an order for several hundred units, we could probably make arrangements for another production run. Write to us and we can try to work out the details. What is the N3's input impedance? 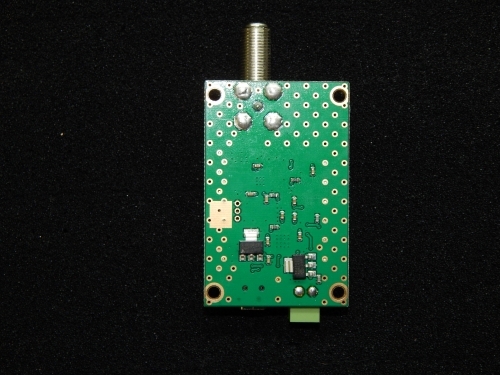 The ThumbNet N3 receiver has an input impedance of 75 ohms. How can I help ThumbNet Directly? There are several ways you can help support ThumbNet. 1) If you are interested in working with students and young adults to help them become aware of STEM activities and would like to set up a ThumbNet station, we'd love to hear from you! Simply sign up over at the ThumbNet Registration page and we'll help you get started! 2) If you can consider a pure financial donation to ThumbNet, please write to us directly and we can make arrangements to accept your donation. 3) If your university or group would like to directly sponsor ThumbNet and its evolving science stations, please let us know and we would be more than happy to discuss it with you. 4) We like to experiment!! If you have another idea on how you can support student education through ThumbNet, tell us about it!